Chicken wings, jalapeño poppers, chips and salsa. It’s all good. 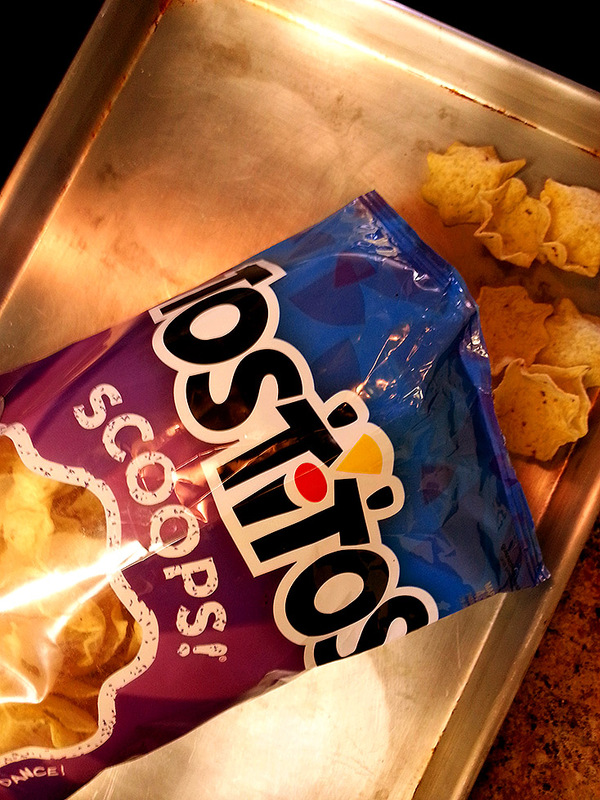 Last year, I made some little taco salad cups using those Tostitos Scoops! chips. 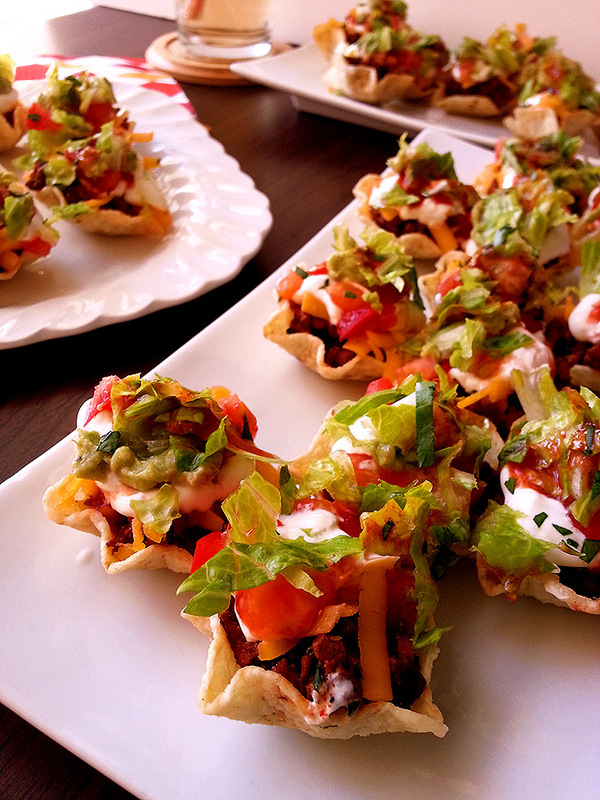 From the first time I saw those chips, I knew they’d make super cute mini taco salad cups. So, I decided to revisit the idea this year and show y’all how easy and adorable they are. Let’s go! Start out by prepping all your veggies and toppings! Make sure the tomatoes are diced very small so that you can fit a few on each of the little cups and it won’t overwhelm the little guys. You can feel free to use storebought guacamole, but if you want to make your own, I found that one whole average sized avocado, when mashed up with seasonings and lime juice, was the perfect amount to give each taco cup a little dollop of guac. I don’t really use a recipe when I make my guac, I just mash my avocado with a spoon or a potato masher and add things to taste. Usually garlic (freshly minced, or granulated), onion powder, salt and pepper, cumin, oregano, lime juice and a dash of hot sauce. Make it however you want! This snack can totally be prepped ahead of time if you wish. Just chop your veggies, grate your cheese and so on, saving the cooking of the meat until no more than an hour before you plan to serve them. The cups tend to get a little soft if they’re left sitting too long uneaten. When all your toppings are prepped, set out a sheet pan and count out 60 chips onto the pan. Make sure you use only the whole, unbroken chips cause if they’re broken, the filling tends to spill out. Once the chips are set out, start cooking the ground beef. Heat a medium sized skillet over medium heat and cook one pound of ground beef until it’s browned all over and not pink in the center. Using a potato masher, slightly smash the cooked beef so that it winds up in small pieces that will be easier to fit into each cup. Once it’s all good and brown, add your taco seasoning packet and the 3/4 cup of water. Stir around over medium heat until the sauce thickens and is evenly distributed on the meat. Scoop the cooked meat into a bowl and let’s get to assembling! Start by placing 1 heaping teaspoon of cooked taco meat into each chip cup. Follow that with a small sprinkling of the cheddar cheese, a small dollop of sour cream (about 1/2 tsp per cup), a few pieces of chopped tomato, a small dollop (1/4 tsp or so) of guac, some shredded lettuce, and finally a few drops of hot sauce. Sprinkle on your parsley or cilantro if you’re using it, and BOOM, you’ve got the cutest Super Bowl snack on the block! The great thing about these is that you can easily double or even triple the recipe if you’re making them for a really large crowd. Just be sure you have people to help you top all of these little babies, cause it can become a very tedious job if you’re prepping solo. Hopefully these will all be snatched up quickly, but if you must keep any leftovers, store them in the fridge in an airtight container for a day or so. Any longer, and the chips start to get super soggy and that’s no bueño. To reheat, just pop a few in the microwave for 20 seconds or so until they’re warmed through. Crunchy mini tortilla cups filled with tasty seasoned ground beef and plenty of taco fixings – they’re such an easy and fun little snack! Throw these onto a large tray and set them in front of all your friends who are watching the game, and they’ll be gobbled up in no time! Stop by tomorrow for another Super Bowl snack recipe, a quick and tasty sweet treat! Easy, Relatively Quick and Oh So Tasty! Another winner from Oven and Apron. Thanks, Amanda. So cute! I will have to look out for these chips. I have never seen the before. I would hope so, but I’m on the other side of the world in Middle Earth New Zealand. Aww that’s true, I forgot! Previous Previous post: baked chocolate donuts!